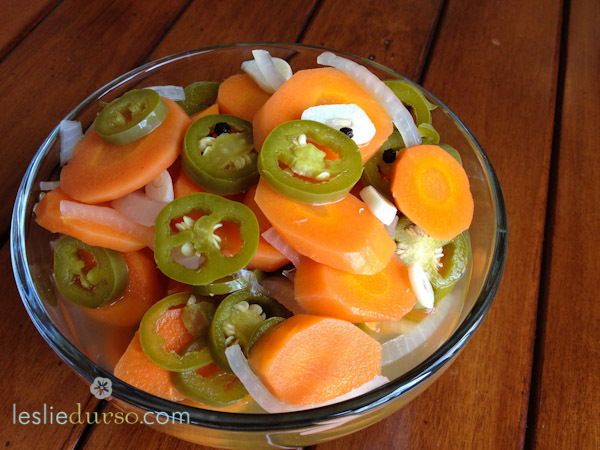 So I pulled all the carrots out of my garden yesterday and I thought… hmmm… what can I make that can showcase the fabulous sweetness of homegrown carrots… I grew up in San Diego and these pickled carrots were in every single taco shop in the city! They are spicy (but not too spicy) and sweet (but not too sweet). They make a fabulous low-cal snack or picnic item! In a large pot on high heat, bring the vinegar and sugar to a boil. When sugar has dissolved, add in all the ingredients, stir, and remove from the heat. Let stand 1 hour. Serve at room temp. Or for even more flavor, let sit in your refrigerator overnight. Have you ever canned these?? Im wondering if you could put the cans in boiling water for 10-15 minutes and preserve them over the winter…..might try that. I love spicy carrots like these! They were always my favorite thing to grab at the taco trucks down in CA. Do you know how long these will last if you keep them refrigerated?